In the first resolution of an NPA account on RBI’s first list, JSW SteelNSE -3.17 % is all set to buy debt-ridden Monnet IspatNSE -1.62 % for Rs 3,750 crore, ET Now reported on Friday quoting sources. Shares of JSW Steel were trading at Rs. 305.70 a piece. TATA Steel buys 72% share in Bhushan steel for a whopping INR 35,200 Crores. Tata Steel has announced its acquisition of Bhushan Steel (BSL) through its wholly-owned subsidiary Bamnipal Steel Ltd (BNPL), completing the resolution of the first case under the Insolvency and Bankruptcy Code (IBC), 2016. BNPL shall be classified as the “promoter” of BSL, and the existing promoters/promoter group re-classified as public shareholders of BSL, according to the resolution plan approved by NCLT. KOLKATA: ArcelorMittal on Wednesday said it has agreed to make concessions to Steel Authority of India (SAIL) on technology transfer to iron out contentious issues in their proposed Rs 5,000­crore automotive steel joint venture. The announcement comes a day after steel minister Chaudhary Birender Singh said the global steel major and SAIL are in ‘final stages’ of formalising the deal. The two companies are believed to be close to ironing out key commercial terms to close the deal, including non­compete and exit clauses as well as finalising policy on arbitration, agency reports said, quoting sources. Responding to ET, an ArcelorMittal spokesperson said: “Our discussions with SAIL continue to make progress, with both parties making significant efforts towards reaching a final agreement. Progressing our partnership to a formal joint venture stage remains the objective, but given the confidential nature of this discussion, we will be making no more comments at this time. 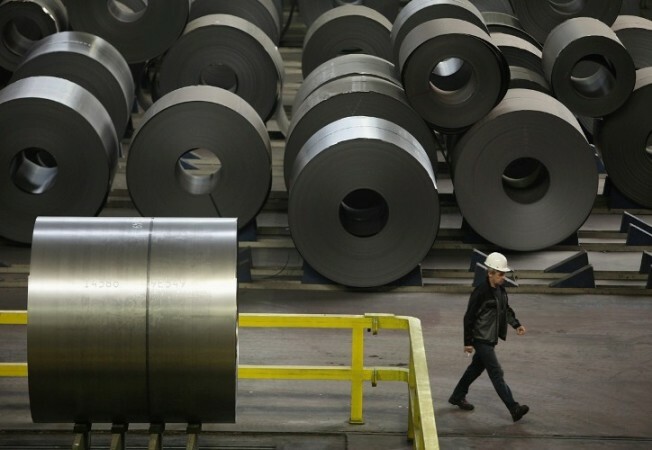 India overtook Japan to become the second-largest steel producer in the world after China in 2016, according to data released by the International Stainless Steel Forum (ISSF). India’s stainless steel production rose to 3.32 million tons for 2016 showing an impressive growth of about 9% over 3.0 million tons achieved in 2015, ISSF said at their annual conference in Tokyo, Japan. “Several government initiatives like ‘Make in India’, smart cities, focus on improving sanitation & waste management facilities, building new infrastructure are is likely to give a strong push to the stainless-steel industry in future,” Mr. Pahuja added. KOLKATA: Steel industry is likely to benefit from the new GST rate for steel which has been finalised at 18% ­­also the slab that includes most number of items. With key inputs like coal, iron ore pegged at 5%, which is the lowest slab under GST, steel companies like JSW Steel, JSPL, Tata Steel, SAIL etc., could be looking at lower input costs. Together, with a substantial slash in transport costs due to unified and standard tax rate under GST, this is likely to help steel companies reeling under large debt and also keep steel prices stable. Commenting on it, H Shivramkrishnan, Director, Commercial, Essar Steel said the GST rates are on expected lines. “We expect the requirement of working capital to go up in the immediate future. But going forward, GST will have a beneficial impact on the steel sector and the economy,” he added. On Friday, Tata Steel stock went up 0.53% to Rs 489.40 on BSE, JSW Steel rose 1.12% to close at Rs 193.55. Companies expect a reduction in logistics costs and time under GST. Presently, each time it crosses a state there are number of check post which delay the supply of goods to the customer. Under GST, a unified and standard rate of tax will reduce this cost and delay. In the post GST regime, industry estimates a 40 to 45% saving on time taken in movement of goods. Exclusion of gas from GST purview is a matter of concern especially for gas­based steel and power plants, said Essar Steel. It will also impact a number of smaller secondary sector players too who plan to use gas, a cleaner alternative fuel to produce steel.